El Nuevo Diario, one of the most important newspapers in Nicaragua, published an interesting article on the economical growth of the department of Estelí, and how it’s boosted by the tobacco industry. We translated most of the article to share it with you all. Franchises. The most important firms with presence in Nicaragua have opened branches in Estelí. The industry, commerce, construction, services and agricultural production in the department of Estelí grows more with each day. 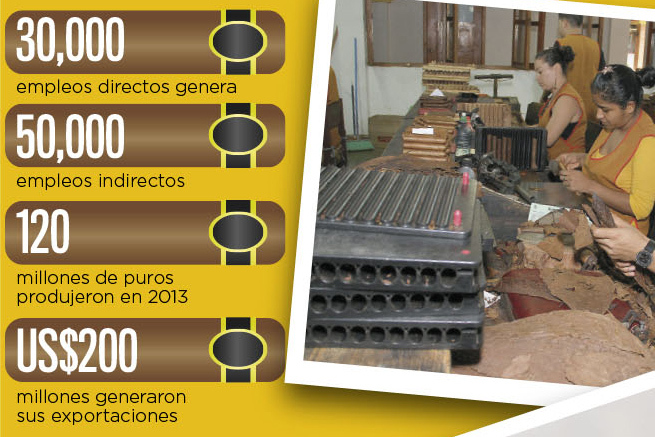 The location of 1,385.4 square miles has turned into the production heart of one of the best tobaccos in the world. “Estelí is one of the departments with the fastest growth in its economical activity. The tobacco industry has dynamized the income of currency through the creation of thousands of jobs”, declared Hilario Mendoza, a local construction business man. The tobacco industry in Estelí is responsible for generating more than 60% of the Gross Domestic Product of its six municipalities, according to data by the mayor’s office and also generate 30,000 direct jobs and more than 50,000 indirect jobs. “A lot of investment has been arriving to the department. The tobacco industry is investing in better technology and trying to give added value not only to tobacco, but also to every agricultural product produced here”, declared Néstor Plasencia, president of the Nicaraguan Association of Tobacco (ANT). This department has 201,548 habitants, which corresponds to 3.9% of the total population of the country. It also has 9,109 commercial establishments. On economical importance, Estelí comes out in 8th place against the rest of departments in Nicaragua, according to a report by the Nicaraguan Fund for Economical and Social Development (FUNIDES). For example, Estelí provides employment to 3.5% of Nicaragua’s total workers, it consumes 2.4% of the country’s energy; 1.9% of hydrocarbons and 3.7% of the total potable water bill. This department also adds the 1.6% of tax collection. However, it comes out as number 2, only surpassed by Managua, on the quantity of workers affiliated with social security. The economical boost of Estelí has made it easier for other sectors to develop, such as turism, agriculture and commerce, according to different sources. Commerce is one of the sectors experimenting the most growth. There is a new shopping center with 47 modules, a luxurious hotel and movie theatres, which together sum up and investment of 4 million dollars.